Somewhere, somehow this Little Penguin swam through a slick of heavy bunker-type oil, and was covered from head to toe when found by a little girl with a passion for penguins. Her room, she told me as she handed him over, is plastered with penguin pictures. I first wrapped him in a towel to stop his preening and ingesting oil. I then cleaned eyes and beak. After a rest period, washing in earnest started. Nothing seemed to happen. I dunked him into warm soapy water over and over and as the oil softened the water became blacker and blacker. After three washes he was dressed in a poncho to stop him preening. He was then placed in the sun in front of a blower heater for an hour until he stopped shivering. Next I gave him electrolytes by tube into the stomach to counter the dehydrating effects of the ingested oil, and charcoal tablets to absorb the toxins. The following morning his faeces were normal but he still smelled very oily. So reluctantly I gave him another bath and blow dry in front of the heater. From then on things went well. He was put into a pen in the garden and at first swam a little in his pool and preened a lot. Over the next four days he began spending most of his time in the water. 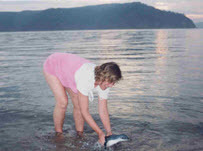 He had learned to take fish from my hand and was consuming 20 whitebait 4 times a day. He appeared to have regained his full waterproofing and was ready for life in the wild once again. At about an hour before sunset the penguins congregate offshore from their nesting grounds, calling each other as they gather in flocks before going ashore. This was the time to let him go. I took him to the beach and he initially swam out a little way, dived and came up through the seaweed at my feet, a piece of bright green weed on his head and covering his eyes. I picked him up, removed the weed and paddled him out into deeper water, pushed him in the right direction and this time he went seaward, diving and surfacing, diving and surfacing, until he was out of sight.